I know this is probably very usual but Whiskey is no longer with us. He was 11 when he had to put him down on Sept. 11 2001. 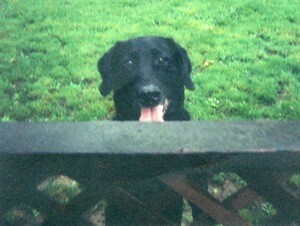 He was a black lab. My husband and I got Whiskey back in 1989. Our daughter was 2 years old and when we went to see the puppies, Whiskey was the first one to come running over to her and start playing. He would follow her all over. Whiskey use to love to go hunting. My husband never took him until he was 4 years old but he knew exactly what to do. After that first time, he would get so excited when my husband would get his hunting gear out. Even just before he died, he would try so hard to get up in the truck to go. Whiskey also loved playing outside. Give him a ball and he would play for hours. He was my husband's best friend. Whiskey would never leave our yard. He was our "babysitter" when the kids were 7 and 4 years old and were outside. He knew that they were not suppose to go in the front yard. One day we heard him barking, when I looked out, our daughter was on her way towards the front yard because her ball had rolled up there. I think he was either warning us or he was "yelling" at her to get back. You must miss Whiskey so very much and the pain must have been extra difficult because of the date you had to send him to heaven :-( I am sorry for your loss and thank you so very much for sharing Whiskey's story with us! I am giving a thumbs up in memory of him! Your story was not "unusual", it is beautiful. Thumbs up for a great bond.